You all may remember that sometime in May I sent in my samples for a FTDNA Family Finder autosomal DNA test. Well, my results are in! My mother’s side: paternal-Azorean (same island, Sao Miguel); maternal-English, Irish, and Welsh. My Welsh ancestors made a detour through Austrlia for a decade or two. I am not surprised by this break down except for the 3% Finnish. I’ve been told that this is within the margin of error, so I’m not concerned about it. After I looked at my origin, I checked out my matches. I was surprised and happy to see that I had a top match with a known Pacheco cousins (our lines are from Achada and Fenais da Vera Cruz on Sao Miguel Island). This is good stuff, I think, because we have a known connection. We share great great grandparents. I had 16 pages of matches. Most were 5th and remote. I had one that was a 2nd-4th. It’s a woman in England. Then I have 10 matches of 3rd-5th. The rest are 5th or remote. After I looked at my matches, I checked to see if I have any people in common and what chromosome we match in. So far, I’ve come up with 3 people that I match in the exact same chromosome (all 4 of us the same). All 3 of them have English roots. 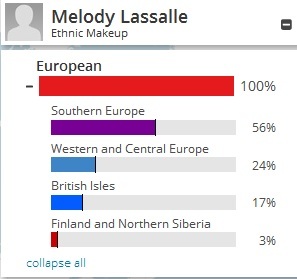 I think it’s interesting that I am part of FTDNA’s Azores DNA Group yet my top matches, except for my known cousin and one other, are all English/Irish. It kind of gives me hope that I might make a connection with my great grandfather’s roots. I’m going to be sending out emails this weekend. Hopefully, I’ll get some responses. After that I’m going to upload my results to GEDMatch. I know I have other cousins who have had their DNA done. Maybe I will find some long lost cousin. This is exciting news! I haven’t done much work on my family, but I have a lot of information my mom did. How do you know when it’s time to do your DNA?